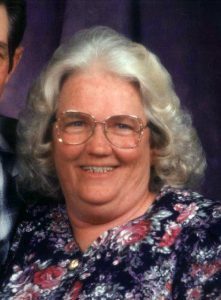 Graveside services for Emma Lu Tackitt, 79, Gepp, Arkansas, will be held at 11:00 a.m., Friday, March 29, 2019 at Hurst Cemetery, under the direction of Robertson-Drago Funeral Home. Mrs. Tackitt passed away at 9:20 a.m., Tuesday, March 26, 2019 at Brooke Haven Healthcare. She was born June 2, 1939, in Fulton County, Arkansas, to Austin Grant Crawford and Mattie Mae Trivitt Crawford. On March 1, 1955, she was married at Salem, Arkansas, to James Evert Tackitt, who preceded her in death on January 5, 2019. She enjoyed gardening, embroidery and loved spending time with her family. Mrs. Tackitt was of the Pentecostal faith. She is survived by six children, Garry Wayne Tackitt and wife, Amy, Gepp, Arkansas, Ronald Dean Tackitt and wife, Gaila, Alton, Missouri, Kenny Dale Tackitt and wife, Deborah, Alton, Missouri, Anita Sue Rieger and husband, Ron, Dora, Missouri, Linda Fawnelle Vaughan and husband, Keith, Cabool, Missouri and B. J. Tackitt, Gepp, Arkansas; sixteen grandchildren; thirty great-grandchildren; one sister, Audrey Pope, Glenwood, Arkansas; and several nieces and nephews. Her parents, husband, one son, Larry, one grandson, Michael D. Tackitt, one daughter-in-law, Sarah Jane, three brothers, Billy, Donnie and Bobby Crawford and one sister, Reva Webster, preceded her in death. Memorial contributions may be made to Hurst Cemetery or St. Jude’s Children’s Research Hospital and may be left at Robertson-Drago Funeral Home. What an amazing woman!! prayers with all the family just now.